Location in Orange County and the state of New York. New Windsor is a town in Orange County, New York, United States. The Town of New Windsor is in the eastern part of the county, bordering the Town of Newburgh and the City of Newburgh. The population was estimated at 25,244 in 2010 by the US Census. The National Purple Heart Hall of Honor is located on Route 300 in the Town of New Windsor. The region was originally inhabited by the Munsee people, part of the Lenape confederation. The first European settlers were colonists from Scotland who arrived in 1685. The Town of New Windsor was created in 1763. Settlement rights in the area that now encompasses the town were obtained from the Munsee by Governor Thomas Dongan, who encouraged the settlement of a party of Scottish colonists led by David Toshack, the Laird of Monzievaird, and his brother-in-law Major Patrick McGregorie. They arrived in 1685 and settled in the area overlooking the Hudson River near Moodna Creek. McGregorie is said to have built a cabin north of the creek on Conwanham's Hill at Plum Point, while Toshack set up a trading post south of the creek on Sloop Hill. In June 1685, Governor Dongan appointed McGregorie Muster-Master of Militia for the City and Province of New York. A rival claim was obtained in 1694 by Captain John Evans of HMS Richmond, who was granted powers and privileges as lord of the manor. The next governor, the Earl of Bellomont, decided that this was unfair to the settlers, and had the Evans grant annulled in 1699. An additional patent of 1,000 acres was issued in 1709 to William Chambers and William Southerland. 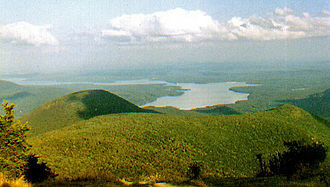 Around 1709, the portion of the town nearest the Hudson River was organized under the Precinct of the Highlands (Ulster County), remaining thus until 1743. In 1762, separate precincts were created for the Town of New Windsor and Newburgh. The name of the town is from Windsor, England, with the New being prefixed. By whom this was conferred cannot be ascertained, but first appears in 1728 records of the London "Society for the Propagation of the Gospel in Foreign Parts". Among one of the earliest roads was the King's Highway, later known as "the Goshen Road", which ran north and south. Among the early residents of the town was William Ellison who kept as early as 1732 kept a store and owned sloops that sailed from New Windsor to New York. Captains James and William Jackson also owned their own sloops. During much of the Revolutionary War, New Windsor served as the major depot for the Continental Army and Army Medical Dept. The majority of Town residents supported the war efforts and its leaders. 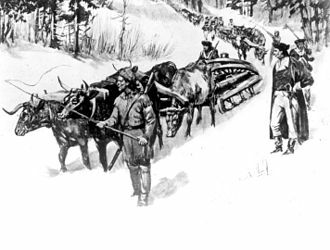 In October 1782, the troops began to arrive and set up tents, while they began building their huts. 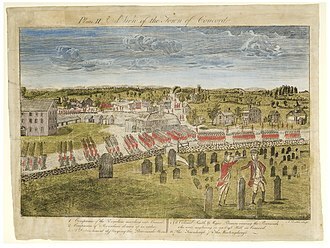 This encampment or cantonment covered 1600 acres (6.5 km2) and quartered 6000–8000 men, women and children from New York, New Jersey, New Hampshire, Massachusetts and Maryland. Here this army built a log city of over 700 huts for the soldiers and many other outbuildings, guardhouses, blacksmith shops, a stable, kitchens, and a hospital. In addition, a long building called the "Temple" was constructed. It was proposed by Rev. Israel Evans, Chaplain to the Army, that a structure be built for religious services. The building also served a general meeting hall. Upon its completion, the officers held a ball. In order to reward the fidelity and faithfulness of soldiers, Gen. Washington ordered the establishment of an honor, the Badge of Merit, to be bestowed on them. Today, this honor is known as the Purple Heart. In an effort to preserve this encampment, the Town of New Windsor acquired a 167-acre (0.68 km2) tract consisting of much of the former hut sites. Since 1936, the Town of New Windsor and the membership of the National Temple Hill Association have striven to ensure the preservation of this, the final winter encampment. The Little Britain Presbyterian Church was organized by Irish and Scottish immigrants. The first church building was constructed in 1765 used by the Continentals as a hospital. This was subsequently destroyed by fire and a new structure was erected in 1807. In 1814, the town was divided into nine school districts. The first school was a one-room schoolhouse built on Quassaick Avenue in 1841. Epiphany Apostolic College was founded in 1925. The site is now owned by the Newburgh Enlarged City School District. Between about 1858 to 1859 the Palmer and Longking company operated on the Quassaick Creek the first large scale factory for the manufacture of "bellows-box" daguerreotype cameras. The factory, on the site of Sterrit's former pin factory, had approximately thirty-five employees. The building was later converted to a flour mill and subsequently burned down. Knox's Headquarters: In 1724 Thomas Ellison purchased the Vincent Matthews property at Vails Gate. In 1754 Thomas Ellison Jr. had noted stonemason William Bull of Hamptonburgh build a stone mansion and mill off Forge Hill Road. The property later passed to his son, John Ellison. Grain from as far west as Montgomery was ground and sold at this mill. 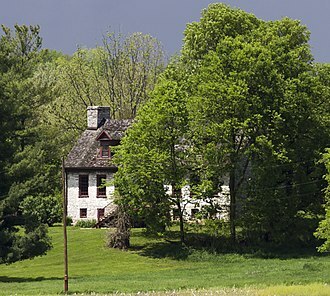 The house later served during the Revolutionary War as a general's headquarters by Nathanael Greene, Horatio Gates and subsequently by Henry Knox. New Windsor Cantonment State Historic Site: A patent was granted to Colonel John Haskell in 1719 of 2,000 acres and another 2,000 acres in 1721 upon which he settled in 1726. He erected a log cabin on what was known as the Dusenberry farm, upon which the army erected the Temple when encamped there. In addition to the Last Encampment of the Continental Army hut sites owned by the Town of New Windsor, the temple site is operated by the State of New York, known as the New Windsor Cantonment. Located there is the Mountainville Hut, believed to be a survivor from the encampment. Edmonston House: James Edmonston came from County Tipperary, Ireland in 1720. For time his log cabin was the only house between New Windsor and what would become Washingtonville. A stone house located on Route 94 was built by James' son William in 1755 to replace the log cabin. The Thomas McDowell House, located on Lake Road in the Little Britain section of the Town of New Windsor was built around 1770 by McDowell, an early settler of the area. It was added to the National Register of Historic Places in 2004. The Brewster House: Samuel Brewster and his brother Henry came to New Windsor about 1743 and had been among the first proprietors of the township in 1749. The Brewster House was built in 1762 as a simple fieldstone house. Brewster was a member of the Committee of Safety during the American Revolution. 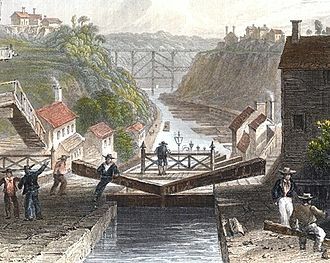 He is mainly remembered in local history as the owner of a saw-mill, forge and anchor shop and assisted in forging the chain which was stretched across the Hudson River in the hope of checking the movement of British vessels up that stream. The building now houses Schlesinger's Steak House. The Vails Gate United Methodist Church (originally the New Windsor Methodist Church) was founded in 1789. The congregation met in John Ellison's store until 1807 when a church was built on land donated by Ellison. It was the first Methodist Church built in Orange County. St. Thomas Episcopal Church is located on River Road in New Windsor, New York, a short distance off US 9W. It was established in 1818 on land bequeathed by Thomas Ellison. It is a small stone building listed on the National Register of Historic Places in 2006. St. Joseph Roman Catholic Church began as a mission church in 1880. In August 2015 St. Joseph's parish merged with the parish of St. Thomas of Canterbury in Cornwall-on-Hudson. Ridgecrest Baptist Church on Blooming Grove Turnpike was begun in 1962. According to the United States Census Bureau, the town has a total area of 37.0 square miles (95.9 km2). 34.8 square miles (90.1 km2) of it is land and 2 square miles (5.2 km2) (6.03%) is water. The east town line, marked by the Hudson River, is the border of Dutchess County, New York. Part of the north town line borders the City of Newburgh. The remainder of the north town line is with the Town of Newburgh and the Town of Montgomery. Interstate 87, the New York State Thruway, is a major north-south highway. NY-207 is an east-west state highway. Beaverdam Lake – (1) a lake at the south town line, (2) part of the hamlet is located by the lake. The hamlet is also located in the Town of Blooming Grove. Clancyville – Quassaick Bridge – early 19th-century community built around once-thriving manufacturing mills located on the Quassaick Creek. Established by many Polish, Italian and other immigrants who built small homes, enlarging them as they prospered. The area was built on the early farm of John J. Clancy, who subdivided it into small building lots. Sometimes referred to as Ducktown by local residents, whose practice was to keep ducks and other poultry about their homes. Machin’s Battery – Capt. Thomas Machin was entrusted with the construction of fortifications on the Hudson River to prevent the British advance up the Hudson River. Machin's Battery of Twelve Guns, was Placed on the South End of Plum Point, to Support the Cheveaux-de-frize to Polopel's Island, 1777, however this did not stop the British advance north to burn Kingston. Plum Point – (Kowawese Unique Area) – a park, opened in the fall of 1996, located directly on the shore of the Hudson River. From this vantage exquisite views of the Newburgh Bay to the North and Cornwall bay to the south can be seen. Plum Point was an almost always occupied site from pre-historic man to the present. Rock Tavern – a hamlet near the west town line on NY-207. Rock Tavern is named for early landmark that was a gathering place for many years. The Tavern owned and operated by John Humphrey in 1740 was located near the intersection of present-day Forrester Road. The tavern gets its name from a large boulder which formed its foundation. 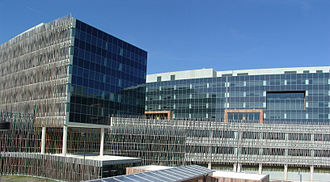 It was here that the plans were made for the organization of the present Orange County. Rock Tavern has its own post office (zip code 12575) with home delivery to the western portion of the Town of New Windsor and the southwestern corner of the Town of Newburgh. Vails Gate – a hamlet south of the City of Newburgh. Formerly Mortinville and Tookers Gate it was a site at which all major roads crossed. The roads were part of the early private turnpike system, which was served by a toll gate to collect tolls. Remnants of former 19th century business community still exist including Lewis Hall on Rt 94 which served for many years as town hall meeting place prior to construction of 244 Union Ave., the old town hall. Vails Gate has its own post office (zip code 12584) with post office boxes, but no home delivery. As of the census of 2000, there were 22,866 people, 8,396 households, and 6,078 families residing in the town. The population density was 657.4 people per square mile (253.8/km2). There were 8,759 housing units at an average density of 97.2 persons/km² (251.8 persons/sq mi). The racial makeup of the town was 84.72% White, 6.76% African American, 0.27% Native American, 1.73% Asian, 0.05% Pacific Islander, 4.17% from other races, and 2.30% from two or more races. 11.10% of the population were Hispanic or Latino of any race. There were 8,396 households out of which 36.1% had children under the age of 18 living with them, 57.7% were married couples living together, 10.2% have a woman whose husband does not live with her, and 27.6% were non-families. 22.4% of all households were made up of individuals and 8.7% had someone living alone who was 65 years of age or older. 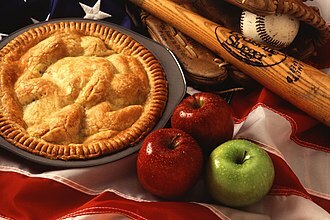 The average household size was 2.69 and the average family size was 3.19. In the town, the population was spread out with 26.5% under the age of 18, 7.1% from 18 to 24, 31.2% from 25 to 44, 22.7% from 45 to 64, and 12.5% who were 65 years of age or older. The median age was 37 years. For every 100 females, there were 97.6 males. For every 100 females age 18 and over, there were 93.8 males. The median income for a household in the town was $51,113, and the median income for a family was $58,292. Males had a median income of $34,283 versus $30,044 for females. The per capita income for the town was $22,806. 5.9% of the population and 1.03% of families were below the poverty line. Out of the total people living in poverty, 52.8% are under the age of 18 and 7.5% are 65 or older. New Windsor has a Dfa Köppen climate classification (Humid Continental: Hot Summer subtype). It is situated in the temperate region of the northern hemisphere and has four distinct seasons. New Windsor is served by the school systems of the three nearby districts: Cornwall, Newburgh, and Washingtonville. The majority of school-age children attend Newburgh schools, with a split in the subdivisions near Vails Gate (Butterhill, Forest Glen, The Reserve) between Newburgh and Cornwall. Far-southwestern New Windsor is served by Washingtonville. Children in the New Windsor area attend a number of schools, including: Butterhill Day School (PK–K), Children S Country School (private, PK–4), Cornwall Central High School (public, 9–12), Newburgh Free Academy (public, 9-12), Heritage Junior High School (public, 6–8), Little Britain Elementary School (public, K–5), Little Harvard School (private, PK–K), McQuade Children's Services Kaplan Campus School (private, 2–11), New Windsor School (public, K–5), St. Joseph School (private, K–8), Temple Hill School (public, K–8), Vails Gate High Technology Magnet School (public, K–5), Windsor Academy (private, PK–3), Willow Avenue Elementary School (public, K–4), Lee Road (public, K–4), Cornwall Central Middle School (public, 5–8) and Woodland Montessori School (private, PK–8). Yeshiva Ohr Naftoli (private, 9–12 and undergraduate) is located in town, but the student body is from out of town, housed in a dormitory. Little Britain Road is one of the oldest in the Town. Stewart International Airport is located partially in New Windsor and partially in the Town of Newburgh. Formerly Stewart Air Force Base, the airport is named after Capt. Lachlan Stewart, who skippered schooners and other sailing vessels about 1850–1870. Stewart was also a lumber merchant and later retired to a dairy farm. In 1930, his grandson, Thomas Archibald ("Archie") Stewart, persuaded his uncle, Samuel L. Stewart, to donate land at "Stoney Lonesome", to the city of Newburgh for an airport. Stewart continued as part of the Strategic Air Command until the late 1960s or early 1970s when the Air Force turned the base over to the MTA for use as a cargo facility. The grand plan to create a jetport lead to the acquisition of over 8000 acres (32 km2) of the present day buffer zone and the loss of many early farms and structures. During the late 1980s, through the efforts of the late State Senator Schermerhorn, the airport passed into the hands of the NY State Dept. of Transportation. Today, Stewart International in addition to its civilian capability, is the home base of the NY Air National Guard and United States Marine Corps Reserve MAG-49 Detachment Bravo. There is a new entrance to Stewart International Airport, via New York State Route 747. Now for the first time, the airport can be accessed directly from the Interstates without encountering local traffic on the state roads. Col. Charles Clinton (1690–1773) – Lt. Col. of NY Militia during the French & Indian War, commanding a regiment at the assault on Fort Frontenac. 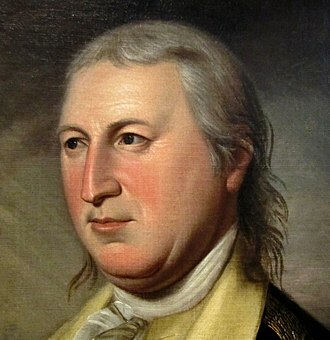 Governor George Clinton (1739–1812) – son of Col. Charles Clinton, George Clinton served in the Continental Congress (1775), was a Brigadier General in the Continental Army (1776), was Governor of New York (1777), and Vice-President of United States under Presidents Jefferson and Madison. Governor DeWitt Clinton (1769–1828) – son of Gen. James Clinton, NY Assembly 1798, mayor of New York City 1803, 1808–1809, 1811–1815; NYS Senate 1799–1802,1806–1811, Canal Commissioner 1816–1822, Governor 1817, 1820, 1824, 1826, Dewitt is best known for the Erie Canal and the NY State Canal System. Fletcher Mathews, Loyalist neighbor of Governor Clinton and brother of David Mathews, Mayor of New York City during its occupation by the British. Fletcher Mathews, was ordered arrested by George Washington around the same time in June 1776 for suspicion of a "Scheme of Inlisting Men for the Kings Service". No evidence was found, and he was subsequently released. 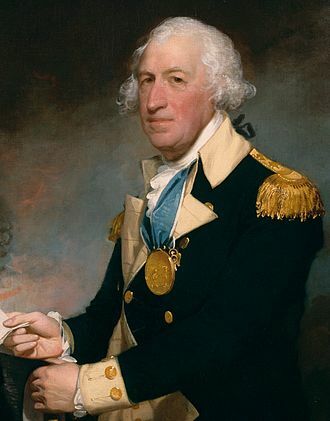 He was permitted to stay in the country upon the end of the war due both to his relationship from childhood to Governor George Clinton and to his wife Sarah Woodhull being the sister of General Nathaniel Woodhull who died in 1776 from wounds resulting from his capture by the British. ENAP is a lumber and building materials cooperative, offering sales support services to independent lumber dealers, is headquartered in New Windsor. ^ "Schlesingers Steak House – History". Retrieved 27 April 2016. ^ "History". Retrieved 27 April 2016. ^ "Newburgh town, Orange County, New York Archived 2011-02-27 at the Wayback Machine." U.S. Census Bureau. Retrieved on February 2, 2011. ^ "New Windsor town, Orange County, New York Archived 2011-02-27 at the Wayback Machine." U.S. Census Bureau. Retrieved on February 2, 2011. ^ "History – About the Airport – Stewart International Airport – Port Authority of New York & New Jersey". Retrieved 27 April 2016. ^ a b c "Town of New Windsor, New York > About > Town Historian > Famous Sons". Retrieved 27 April 2016. Wikimedia Commons has media related to New Windsor, New York. 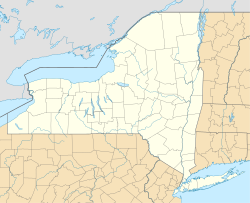 Montgomery is a town in Orange County, New York, United States. 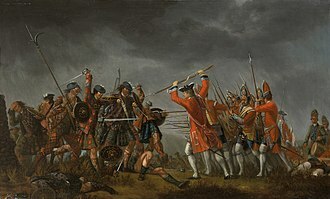 The population was 22,606 at the 2010 census and it was named in honor of Richard Montgomery, an American Revolutionary War general killed in 1775 at the Battle of Quebec. The Town of Montgomery is in the part of the county at the county line shared by Ulster County. Montgomery is immediately west of the Town of Newburgh and it contains three villages, one called Montgomery, as well as Walden and most of Maybrook. The early town began as a patent to Henry Wileman in 1710 and he was the first of a group of Palatine Germans to emigrate and settle land around what is now the village of Montgomery. The town was established as Hanover in 1772, but became the Town of Montgomery in 1782. The community of Montgomery set itself off by incorporating as a village in 1810, and in 1855, Maybrook was the last village to incorporate, in 1926. 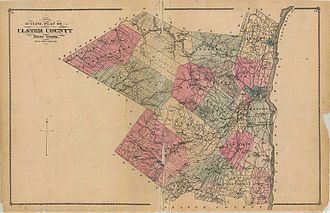 Montgomery is bordered on the east by the Town of Newburgh, the towns of Wallkill and New Windsor, from west to east, border on the south. The village of Walden is located in the central portion of town. Montgomery is close to the center, and Maybrook is in the southeast corner, there are no significant year-round settlements outside of the villages, there is a summer colony around Lake Osiris in the northern section of town. Some inhabitants of Lake Osiris have made it their permanent residence, the towns topography is generally level and low, except along parts of its eastern and western boundaries, reflecting the passage of the Wallkill River through it from north to west. There are large swamps in the portion of town, some of them draining into the Otter Kill. Further north, the land becomes drier and more arable and it is mostly farmed, used for small residential subdivisions or left as undeveloped open space. Two areas along the river have been set aside as parks, the countys Winding Hills Park is partially within Montgomery, as are portions of two larger state-level protected areas, Highland Lakes State Park and Stewart State Forest. The New Windsor Cantonment State Historic Site, known as New Windsor Cantonment, is located along NY300, north one mile of Vails Gate, in the Town of New Windsor, Orange County, New York. The site features a reconstruction of the Continental Armys final military encampment, between June 1782 and October 17837,000 troops were boarded here in 600 log huts, over 1,600 acres. 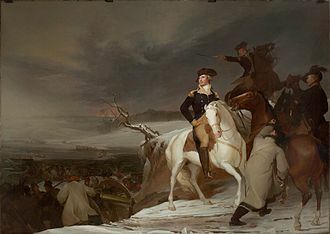 Thus it was necessary to keep the army here, within striking distance of New York and next to the vital Hudson River, on April 19,1783, Washington issued a cease fire order, officially ending the war for the Army. 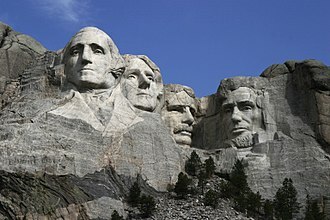 The Temple, where he made his famous speech revealing his vision problems for the first time, is among the reconstructed buildings, the Purple Heart was first awarded here, and the National Purple Heart Hall of Honor was opened November 10,2006 in recognition of that history. After the war, the huts were sold. Some of the walls on the site may be made from stones that came from the fireplaces of the original buildings. New York State Route 207 is a state highway located entirely within Orange County, New York, in the United States. It serves as a connector between the village of Goshen and the city of Newburgh and it has for a long time provided the main access to Stewart International Airport. The highway follows the path of the old Goshen–Newburgh Turnpike and is a road through its entire length. It is shared with New York State Bicycle Route 17, NY207 begins at exit 124 of the Quickway and a junction with NY 17M in the village of Goshen. Also present at the intersection is NY 17A, which terminates at the same junction, entering downtown Goshen, NY207 gains the Greenwich Avenue moniker, until reaching the junction with Church Street, where it turns onto Main Street. Once straightening to the north, the route crosses past the Harness Racing Museum & Hall of Fame, near the junction with Victoria Terrace, NY207 leaves the village of Goshen, dropping the Main Street moniker as it winds north through the town of Goshen. A two-lane countryside roadway, NY207 reaches the hamlet of Kipps, bending northwest at a junction with Kipp Road, winding past the hamlet of Lagrange, the route starts passing multiple farms, passing the terminus of County Route 53. A short distance later, NY207 reaches a junction with CR77, a short distance after, the route crosses under the Port Jervis Line and into a junction with the southern terminus of NY416. At NY416, NY207 turns eastward through Hamptonburgh, entering the hamlet of Campbell Hall, crossing over the former Erie Railroad Montgomery Branch, continuing east through Campbell Hall, the route crosses the Otter Kill and turns northeast through Hamptonburgh as a two-lane road. After making another bend to the southeast, NY207 crosses south of the Otterkill Golf & Country Club, a short distance east of the CR33 junction, NY207 reaches a junction with NY208, forming a short concurrency through Hamptonburgh. After crossing a bridge over Smith Pond, NY207 and NY208 split, passing the hamlet of Burnside, NY207 turns east and leaves the town of Hamptonburgh for the town of New Windsor. Monzievaird /ˈmɒniːˌvɛərd/ is a place in Scotland, situated two miles west of Crieff in Highland District of Perth and Kinross. The village of Monzie, is a couple of miles to the east-northeast, the place was originally named Muithauard c.1200, Moneward 1203. Two different etymologies are given for the name, in the first it is asserted that the name is derived from the Gaelic magh + bard, Plain of the bards. Under this view, the name of the village of Monzie is unrelated except to render the pronunciation of the first syllable Monz as Mon in linguistic sympathy. In the second etymology, Monzievaird comes from magh plain plus edha the genitive case of edh corn plus the Saxon vaird or ward meaning enclosure, under this view the village name of Monzie has the same origin as does the name of the nearby castle, Monzie Castle. Regardless of origin it gave its name to the nearby Loch Monzievaird, Monzievaird was within the Stewardship of Strathearn and it had its own parish church. It was under the control of the Murrays of Tullibardine from the 13th century, following the Act of Union, it was placed in the county of Perthshire. In 1890 it was placed within the parish of Monzievaird. In 1930 the civil system was replaced and Monzievaird was put in the Highland District of Perthshire. From 1975 to 1996 it was part of the Perthshire Kinross District in the Tayside region, in 1996 it came under the new county of Perth and Kinross. Ochtertyre House, the Murray family seat in Perthshire between 1784 and 1790 is located here, overlooking the Loch from an elevated position and its grounds are a designed landscape. The house is a Georgian Category A listed building and it is now a private house, but in its time it has operated as a school, a theatre, and a restaurant. The mausoleum of the Murrays, built in 1809, now stands where the church used to be. The site of the battle is on the side of the loch. King Kenneths Cairn was built in memory of the son of King Duff, who was killed in the battle of Monzievaird that year and buried on Iona. It stands in a prominent position on the edge of the escarpment of Corrie Barvick. ]]On 21 October 1490, Drummonds and Campbells set fire to the old church of Monzievaird. Richard Coote, 1st Earl of Bellomont, known as The Lord Coote between 1683–89, was a member of the English Parliament and a colonial governor. Born in Ireland, he was a supporter of William and Mary. In 1695 he was given commissions as governor of the provinces of New York, Massachusetts Bay, and New Hampshire and he did not arrive in the New World until 1698, and spent most of his tenure as governor in New York. He spent a little over a year in Massachusetts, and only two weeks in New Hampshire, frontier issues were in the forefront during his time in Massachusetts and New Hampshire, where lumber and security from the Abenaki threat dominated his tenure. He was a financial sponsor of William Kidd, whose privateering was deemed to have descended into piracy. 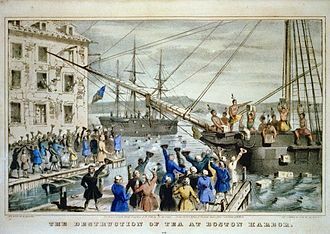 Bellomont engineered the arrest of Kidd in Boston, and had him returned to England, where he was tried, Richard Coote was born in Ireland in 1636. He was the son, but the first to survive infancy, of Richard Coote, third son of Sir Charles Coote, 1st Baronet. His father was created Baron Coote of Coloony in 1660, little is recorded of his early years. In 1677 he is known to have killed a man in a duel for the affections of a young lady and he did not marry her, and in 1680 he married Catherine, the daughter of Bridges Nanfan and the eventual heir to Birtsmorton Court in Worcestershire. Following the accession of the pro-Catholic James II to the English throne, because of the familys record of service to Charles II, his absence from court eventually drew the kings attention, and he was summoned back to court in 1687. He was one of the first to join William of Orange in the Glorious Revolution of 1688 that brought William and he was rewarded for this loyalty with an appointment as Treasurer to the Queen in 1689, a post he held until 1694. It drew attention in the Irish Parliament. That body, still under the influence of James, attainted him, as a result of this, William on 2 November 1689 created him Earl of Bellomont, and granted him over 77,000 acres of forfeited Irish lands. Newburgh /ˈnuːbərɡ/ is a city located in Orange County, New York, United States,60 miles north of New York City, and 90 miles south of Albany, on the Hudson River. Newburgh is a part of the New York metropolitan area, the Newburgh area was first settled in the early 18th century by the Germans and British. During the American Revolution, Newburgh served as the headquarters of the Continental Army, prior to its chartering in 1865, the city of Newburgh was part of the town of Newburgh, the town now borders the city to the north and west. 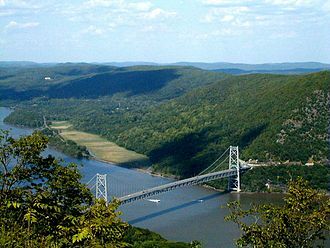 East of the city is the Hudson River, the city of Beacon, New York across the river, the entire southern boundary of the city is with the town of New Windsor. Most of this boundary is formed by Quassaick Creek, in May 2016, the city requested help for its PFOS contaminated water supply under Superfund. At the time of European contact the area of Newburgh was occupied by the Waoranek, the area that became Newburgh was first explored by Europeans when Henry Hudson stopped by during his 1609 expedition up the river that now bears his name. 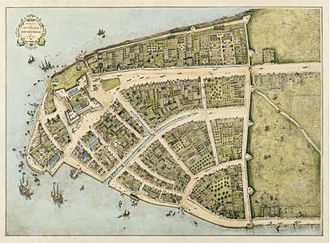 Around 1683 provincial governor Thomas Dongan purchased the land from the Woaranek, the first settlement was made in the spring of 1709 by fifty-four Palatine refugees, sponsored by Queen Anne of Great Britain. The settlers named it the Palatine Parish by Quassic, in 1743 a ferry at the foot of First Street had been established between Newburgh and Fishkill Landing. In 1752 the land had been surveyed by Cadwallader Colden and named Newburgh after Newburgh in his native Scotland, shipyards were established and docks and warehouses lined the waterfront. Newburgh was the headquarters of the Continental Army from March,1782 until the part of 1783. 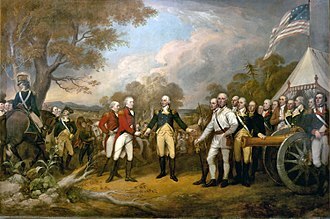 While the army was camped at Newburgh, some of its senior officers began the Newburgh conspiracy to overthrow the government, General George Washington was able to persuade his officers to stay loyal to him. The army was disbanded here in 1783, Washington received the famous Newburgh letter from Lewis Nicola proposing that he become king here. It drew a rebuke from Washington. The Moodna Viaduct, location for a key scene in the 2007 film Michael Clayton. The tidal marshes at the creek's mouth, home to some rare species and communities. Hector de Callière was governor of New France while Bellomont governed New York. Bellomont's Massachusetts advisor, Elisha Cooke, Sr.
An old logging road through a pine plantation at Morgan Hill State Forest in Onondaga County, New York. Entrance sign for the East Otto State Forest in Cattaraugus County. Reconstructions of the Temple and another building.